Luxury garden furniture not only adds to the attractiveness of the landscape about the home but offers a cool, shady retreat from the direct heat of the summer sun. The best time to plan for luxury outdoor furniture or landscape ornament is in the late summer. Then the flowers are in their prime and one can visualize placement rather than when the garden lies bleak and desolate. Cost is not the only thing to take into consideration when creating lavish garden effects. Character should be considered as well. In order to obtain this satisfactorily, the accessories should be planned after careful research. The garden water fountain is the most important detail and requires more careful thought than any other part of the garden setting. It makes no difference what its construction is, so long that it fits in with the general landscape design. Styles and usage of luxury outdoor furniture are as clearly defined as in interior decoration. The ever-changing tide of landscape design brings in its wake a constant development of new and original ideas in the furnishing of our garden spaces. Flowers have been with us forever and so has a love for outdoor living areas and gardens as living rooms. 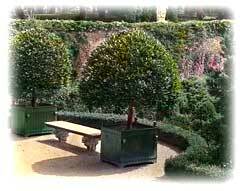 History relates that garden benches were found in the gardens of the early Romans and Greeks. The ornate iron patio furniture that first came into existence during the Italian Renaissance were made popular again in the Victorian era. 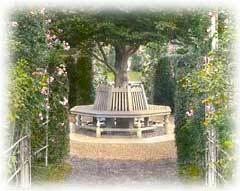 The principal materials for garden benches are stone, marble, wrought iron, terra cotta or wood. The least expensive and most popular of any of the materials that is used for outdoor seating is wood. Any garden, however small, will be improved by the inclusion of a fountain. The trickling of the water is grateful to the ear on a hot summer day, while the jet, by virtue of its continuous movement, attracts the eye. 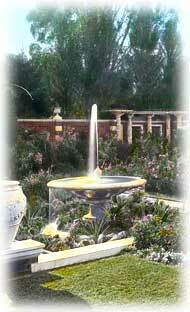 The garden water fountain caters to our universal enjoyment of water in the garden. The fountain need not be the luxury outdoor accessory in the possession of the estate owner alone. The outdoor water fountain can range in style from the simple one inch pipe conducted underground to a convenient spot where a pool is easily constructed, to the ornate tall standing model. Fountains may be of the gurgly or spray variety. Certain fountains give a restful, cool aspect to the garden, which is greatly enjoyed while to some the spray sort is only useful at some distance from the garden bench because of the constant nervous motion. In the fountain pool one finds constantly changing pictures of the blue sky, billowing clouds or summer blossoms. Beautiful flowers, well-kept lawns and well placed trees— are the backbone of a garden landscape design, but a luxury outdoor garden of any size should not be without a summer house or similar outdoor embellishments. An elegant aviary is a wonderfully complicated structure with a garden within a garden designed round an elaborate bird cage constructions built of cast iron. The whole feel to an aviary design is one of restrained elegance with two big square flowerbeds, boxed-edged and showing off topiary with a nearby reflecting pool. The garden or summer house offers possibilities for the enjoyment of the homeowner as well as furnishing an ideal playhouse for the children. Then there is the greenhouse, replicated from those in stately homes in past centuries with iron patio furniture of an ornate design. Great care should be taken not to introduce different periods or materials when placing garden structures on the grounds.